This is the Ground Observations discussion thread for the 2013-2014 season of the Hornby webcam Eagles! 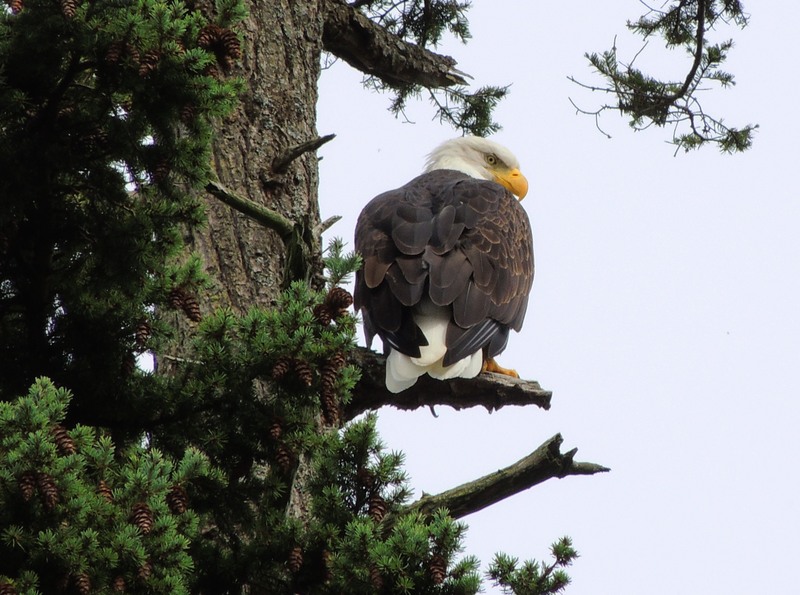 It is a place to post observations, fotos & videos of Mum Dad & their Eaglets, as observed from the ground. So yesterday was cam maintenance & raising day! 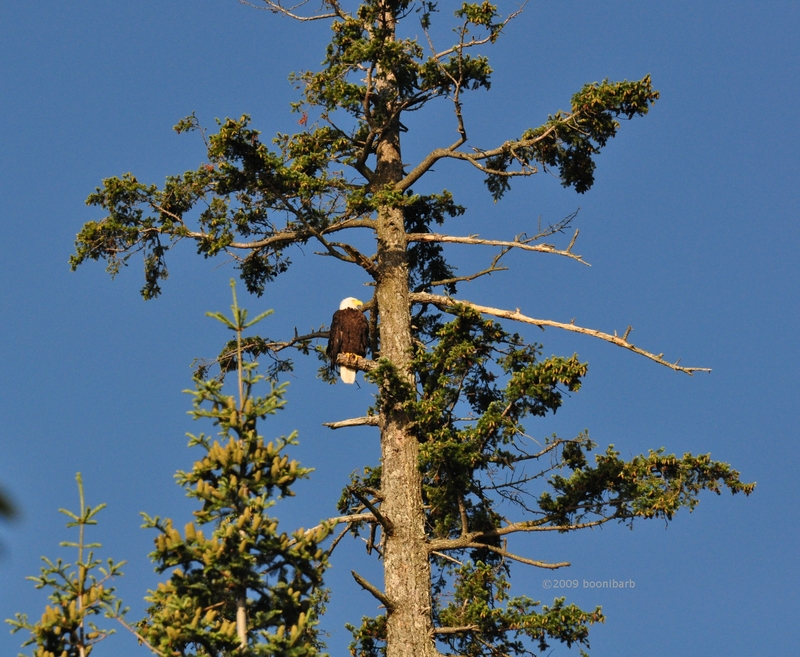 We were in the thick of it when i could swear i heard an Eagle trill! i haven*t heard that sound in quite a few weeks now. Then on the newly activated cam, an Eagle flew into the Babysitting Tree. So i went running over to photograph them. The new arrival was on a familiar little perch branch! Back of head doesn*t look like Mum! Now, if this were a visitor, why would they choose to land on a short little stubby branch, barely wide enough for them to perch on? However, we have seen Dad many times choose this branch. Here is Dad on that branch or one similar to it in 2009. 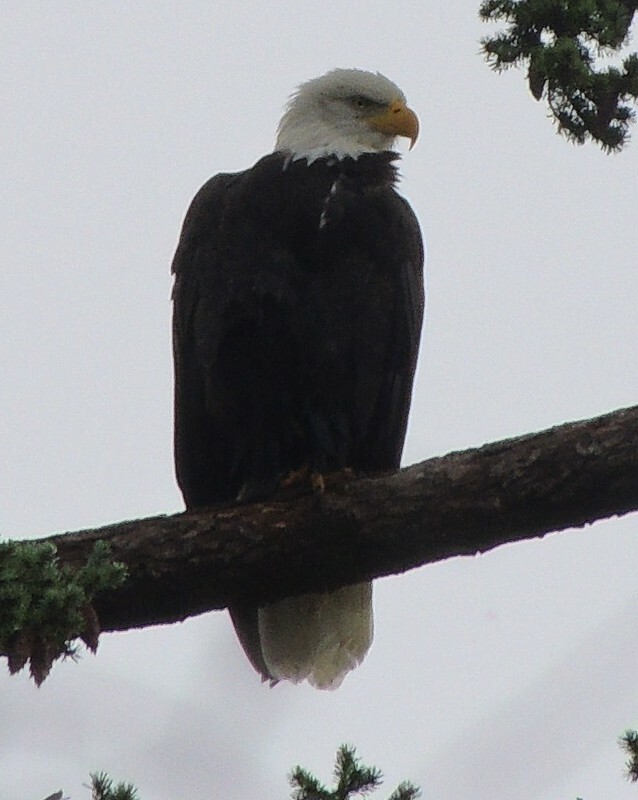 He is facing the water in this one, as is the Eagle in these new fotos. Here*s Mum in that same branch, 2011. 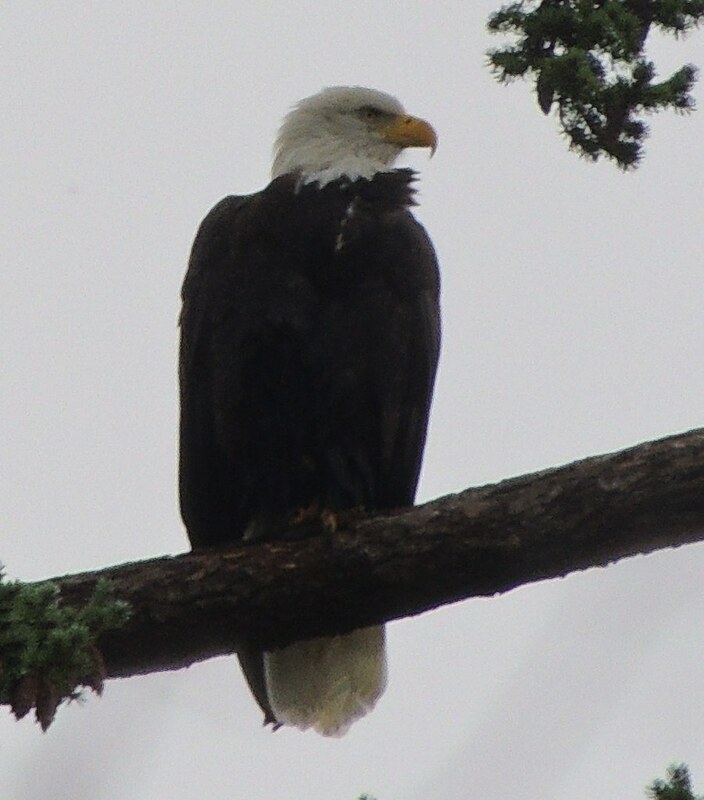 There was a comfort with my approaching presence, that there wouldn*t be with an Eagle who wasn*t used to living in a neighbourhood with people. 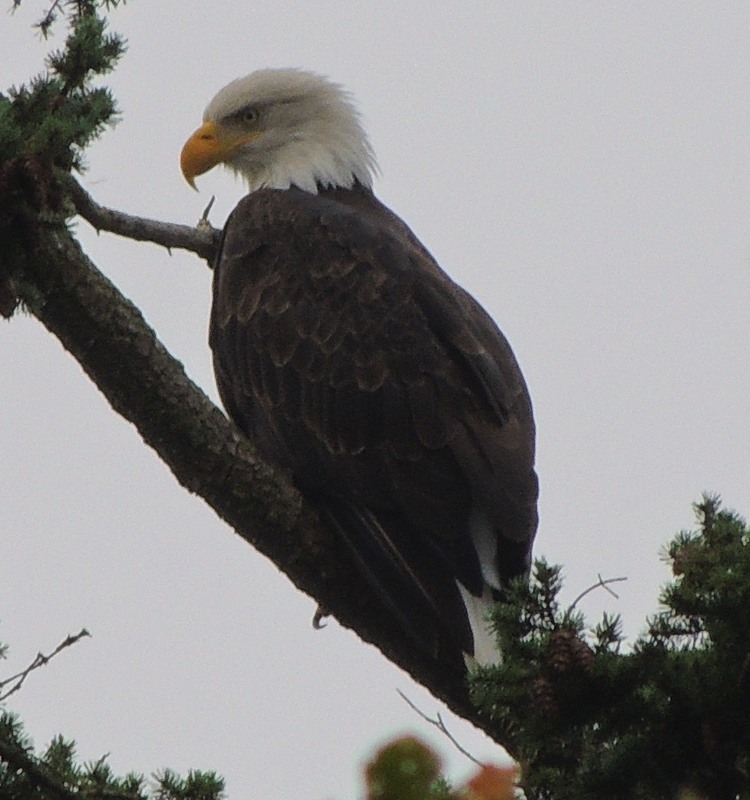 There was construction noise, kids noise, vehicle noise, & this Eagle perched calmly on that tiny branch for four hours. On the lower left of the back there is a faded feather we can keep an eye out, for i.d. & comparison. It is my belief that Dad is home. 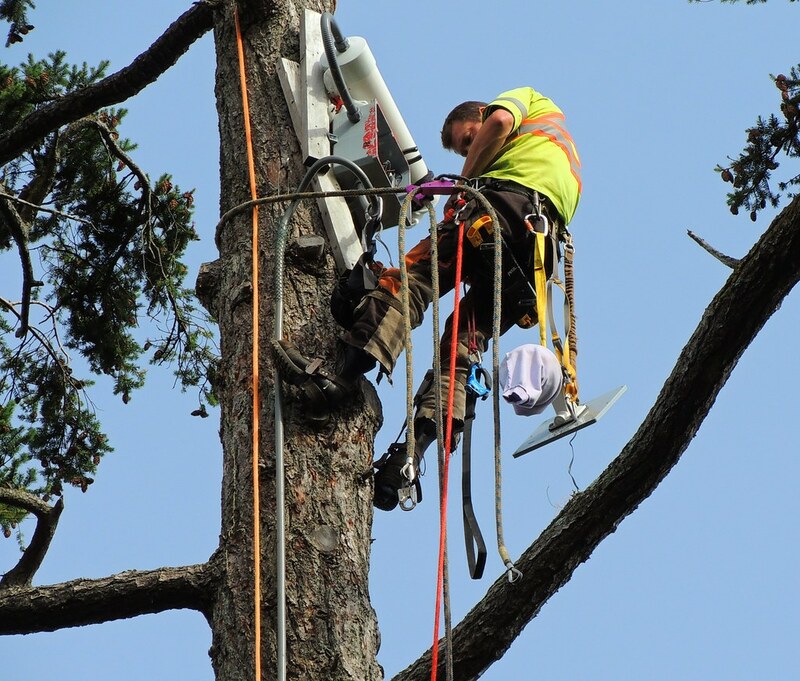 Here is a foto of Dan, almost 200' up, putting our cam system back together. The big tube on top protects our microphone from the elements. The grey box contains the wiring for the mic & cam. Dangling from his left waist on the yellow band is the lid of the gray box & the cam, covered by a purple sweatshirt sleeve. Dangling from that unit are the wires that will connect to the wires inside the grey box, leading down the conduit to our system below. Dan is sitting on his little *bench*, to take the strain off of his boots* spurs hanging onto the bark of the Tree. This is him working, from the other side now. 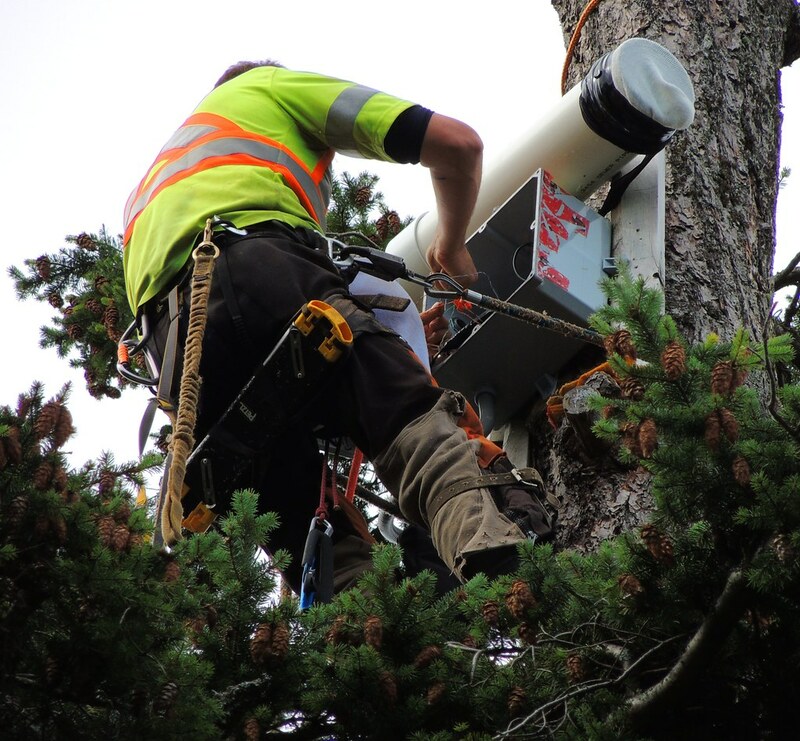 The cam & gray box lid are in his lap & he is attaching the wires to each other. You can hear a Spotted Towhee in the background. Dan is waaaaaaayy up there, & a video shows this the best. The cam & gray box lid are still dangling here. From the other side now. What a great guy that Dan is! All he signed up for was some tree climbing work - and look what he's got now...... a following! And oh how happy we are that the cam is back, Booni is back, (and THANK YOU so much for the ground obs and commentary!!) and Dad apparently back....right on schedule. ... we women take a little longer, so we wait patiently, tap, tap, tapping, for the matriarch of our little nest family to make her grand entrance! Looking forward to a great season with everyone ... much thanks to ALL who make this possible ~I cannot begin to name you all for I would leave someone out~ I love love LOVE this place! hooray, hooray, Dad is back!!! Thank you so much for the photos, Booni! Wooohoooo! The only way to express such delight with Dan, Booni, the HEGPS crew, and everyone involved in this amazing cam! THANK YOU ALL!!!! Now the fun begins! This morning, on cam, an Eagle flew in to the long bare branch & appeared to be eating something that was in their feet. Afterwards, we heard strange calling that sounded very close. So i went down there, expecting to see someone perched at the top of Gregg*s Tree. 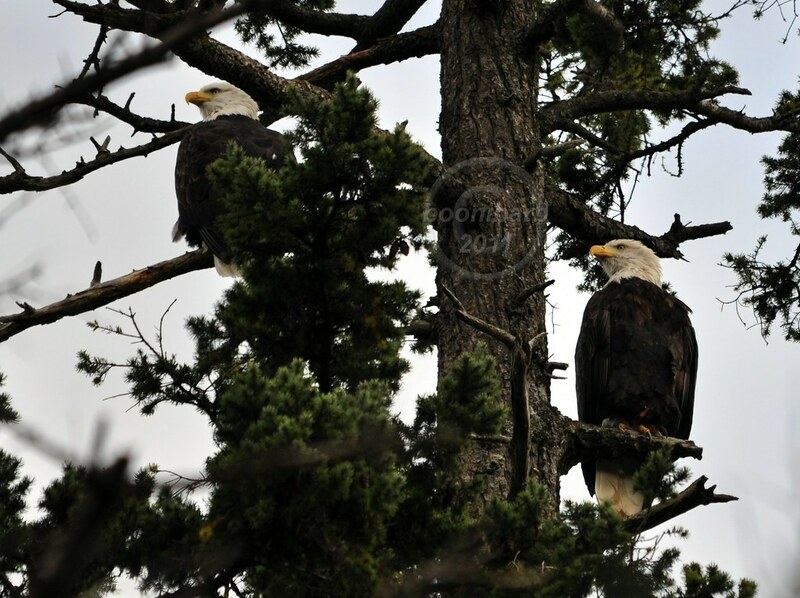 There WERE two Eagles perched in the Babysitting Tree, however, & there were strange vocalizations. 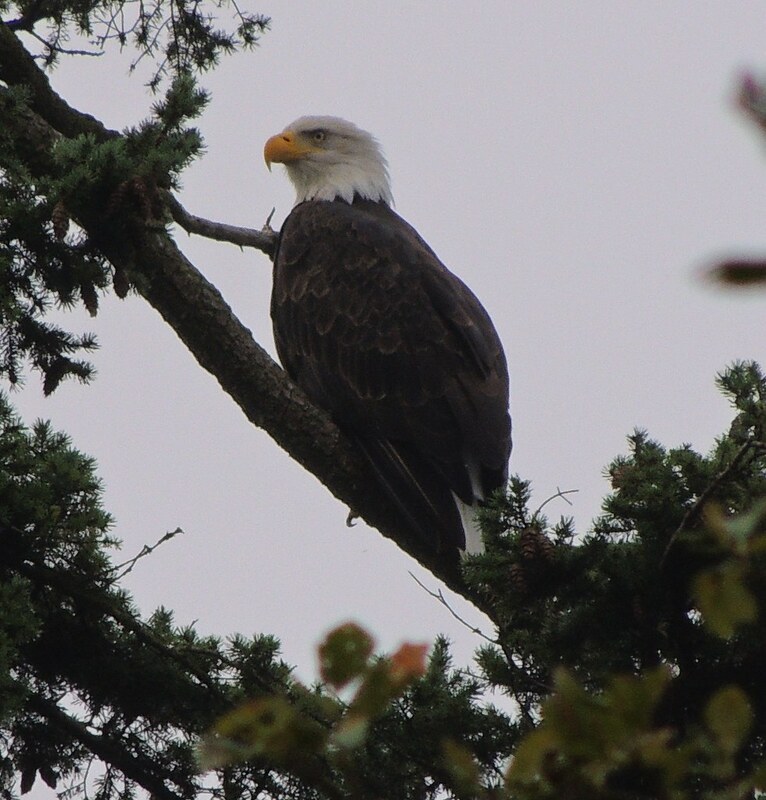 This Eagle was on the backside of the Tree, near the top, looking to our right as we look through the cam. 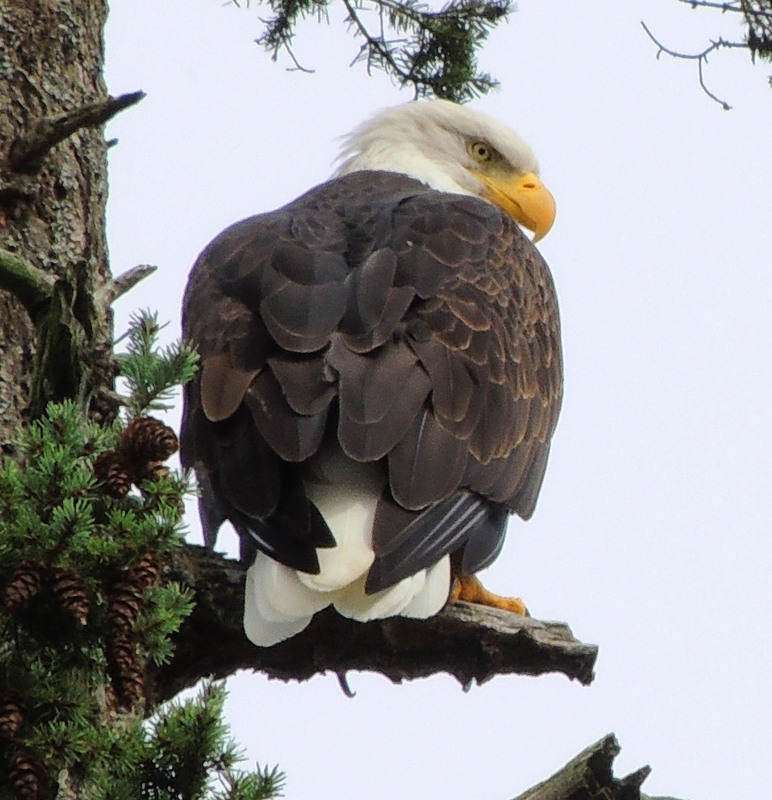 This Eagle was visible from the cam. 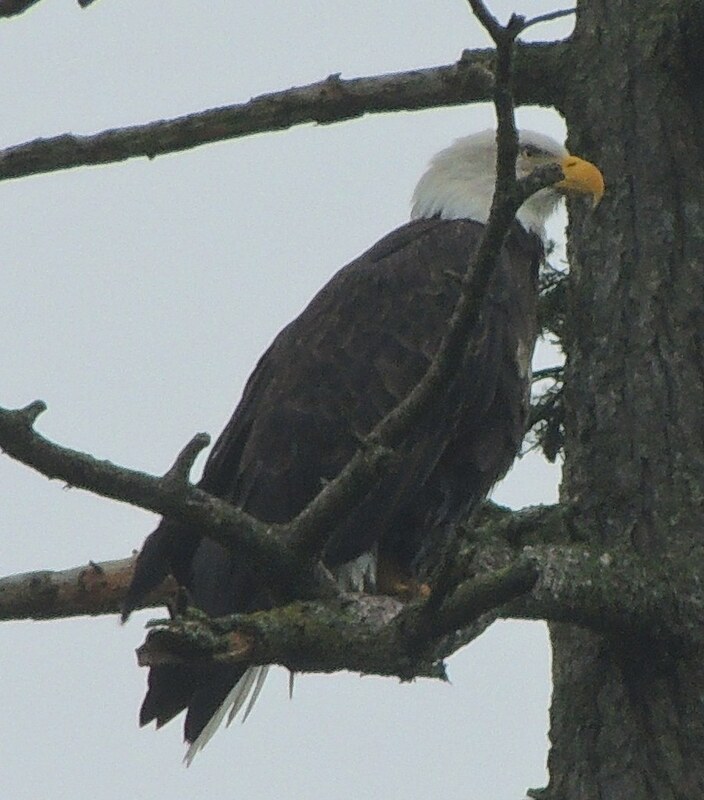 This Eagle was also seen from the cam. This was the one who flew in & landed with food. 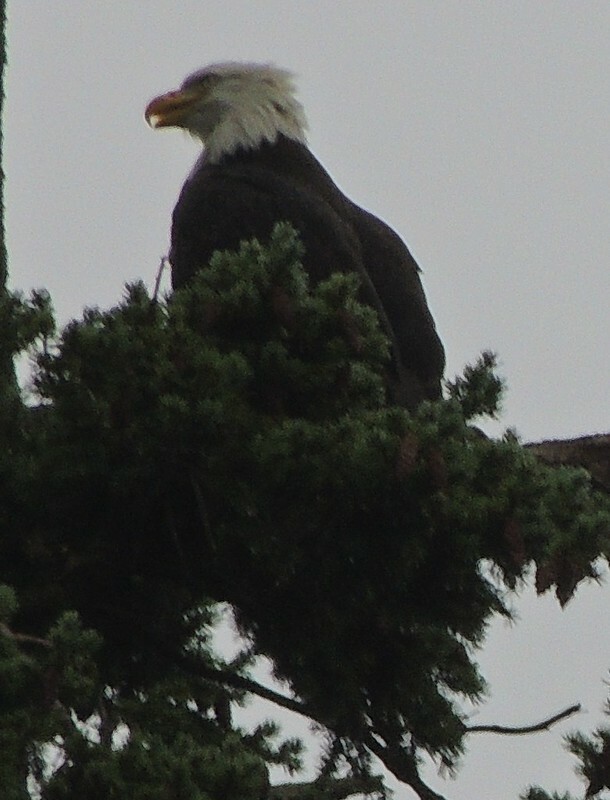 They seemed to be one of the Eagles vocalizing. 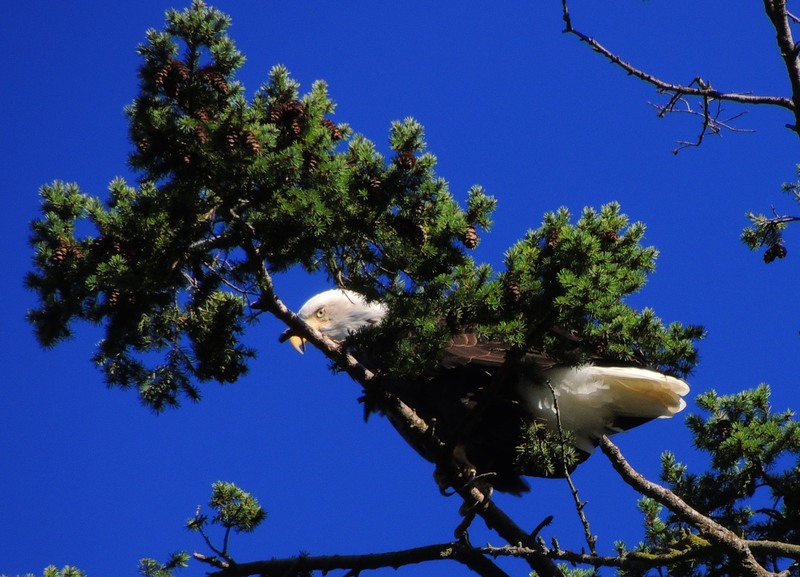 Here is the same Eagle, looking up at the visitors on the Tree. It was foggy & low light, so not the best fotos. i went around to the water side, to see if i could see the Eagles any better. i believe there was a THIRD Eagle, & they were in this long perch branch, on the water side of the Tree, looking out at the water, & towards Sandstone Point. 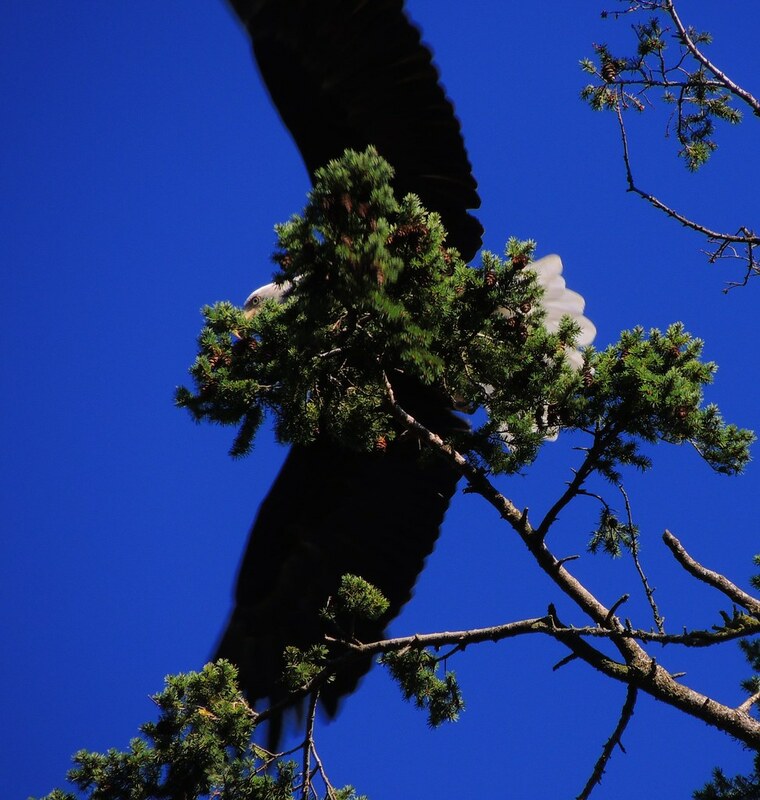 This Eagle flew off, towards Sandstone Point. 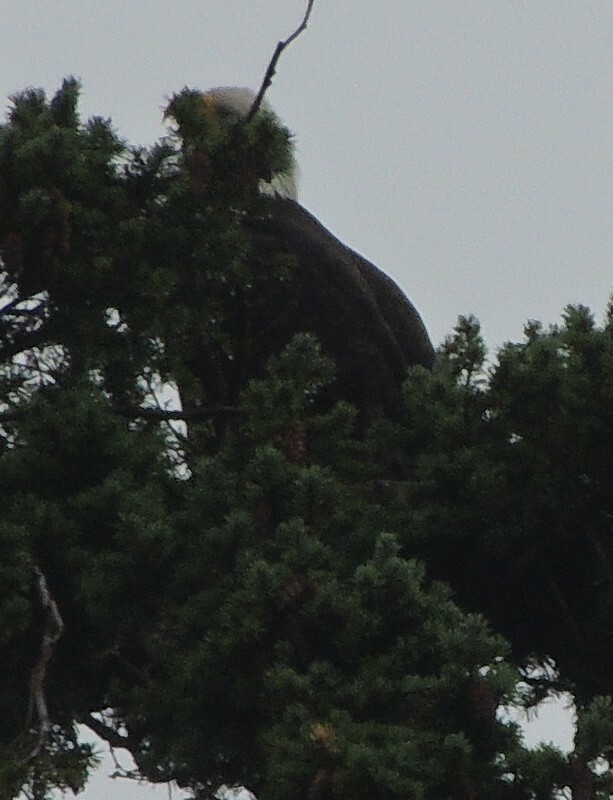 Not having any Eagles i could see from the water side, i went back to the back side of the Tree. 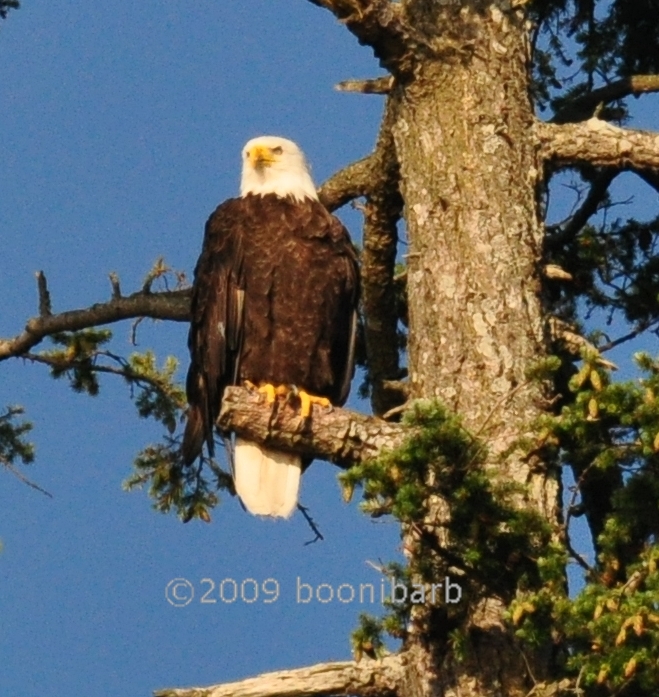 This Eagle was still perched in the long bare branch, facing the cam & looking to our right. They seem to have eaten, as their crop is pushing out their white under feathering, making them look as though they are sporting a white tie! They are also perched casually, & relaxed on only one foot. i believe this is Dad. Booni ... that you so much for all you posted on the 6th!! Dad is handsome as ever! I just wonder who the other eagles were? Do you think Dad was given some fish heads? The pictures gave me much JOY!! 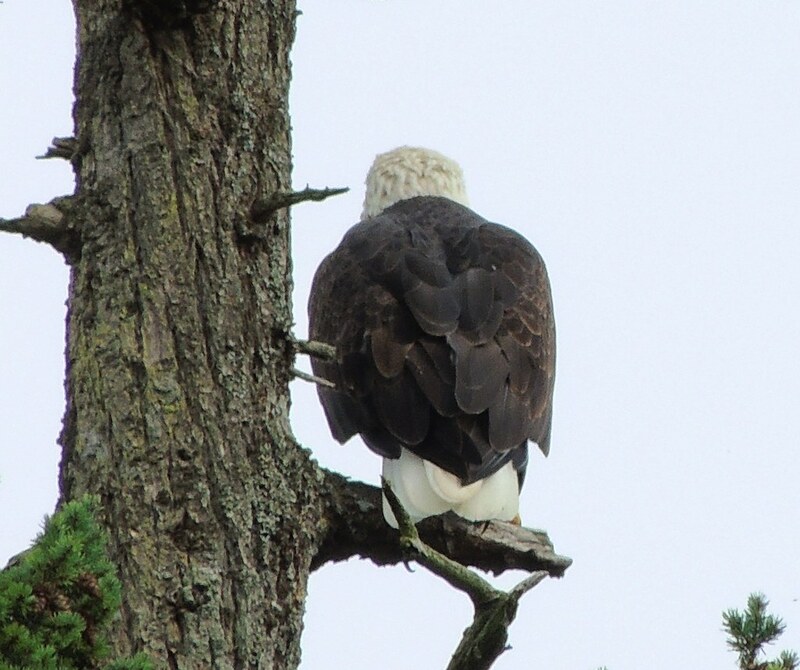 eck, there seem to be other Eagles checking out the area. i am not sure what Dad was eating, when he flew in & landed in the Babysitting Tree. Yesterday, i think Ustream was down at this time, so i biked by the backside of the Nest on my way to somewhere else. 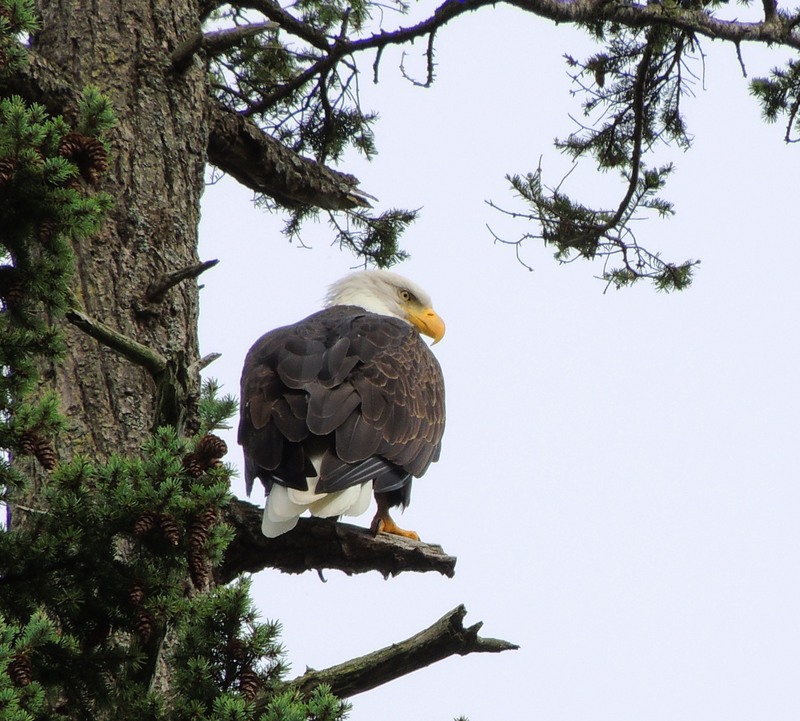 There was a very dark brown Eagle in the Babysitting Tree, so i stopped to see who they were. It may be coincidence, but this Eagle flew off as i walked closer to the Tree, so i am glad i took fotos when i was further away! 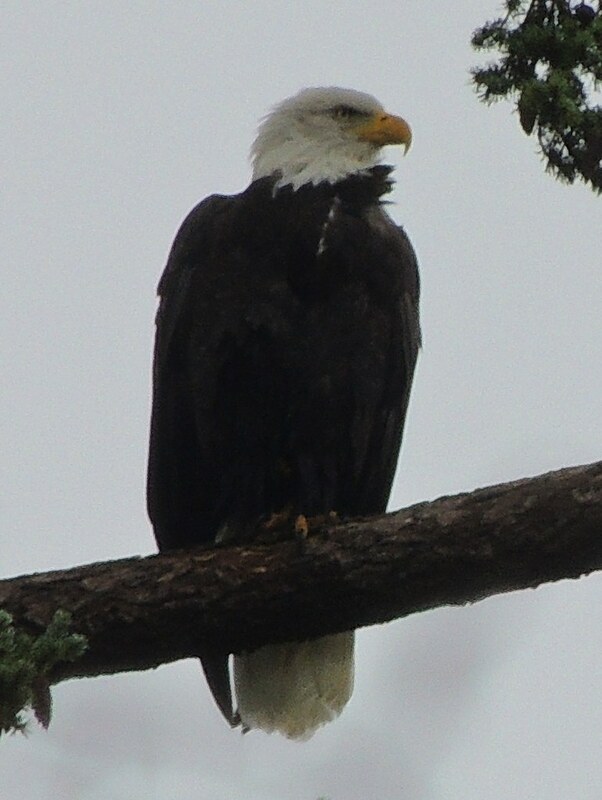 This Eagle did not have the comfort with my presence that Dad has had.